In recent years, ties between North Korea and Russia have become progressively better after a period of relative decline. Nevertheless, Russia has consistently denounced the North’s nuclear adventures since the country’s first test in 2006, and the most recent test has been no exception. Konstantin Kosachev, the chairman of the Russian Federation Council’s foreign relations committee, was among the very first Russian officials to have condemned the test. As fear-inducing as a successful North Korean nuclear test is, there may be an opportunity for Japan and Russia, both important players in Northeast Asian economic and security, to collaborate on helping to promote security in Northeast Asia. Such cooperation on this issue may help the two countries mend their own differences, especially over the disputed Kuril Islands (or Northern Territories, as Japan refers to them). After North Korea’s announcement of yet another successful weapon of mass destruction test, the Japanese government has reached out to a number of countries in Northeast Asia, including Russia, in order to coordinate a response to this latest development. 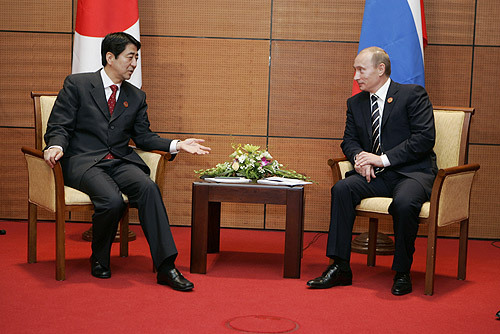 While the Japan-Russia relationship has not been necessarily antagonistic, it has not been unproblematic, either. Both countries would do well to have better relations with each other. Russia would benefit greatly from Japanese capital, and Japan would likewise receive a great boon from access to Russian oil. Japanese Prime Minister Shinzo Abe recently declared his hopes for a peace treaty with Russia, despite provocative actions from Moscow such as Prime Minister Medvedev’s visit to the disputed Kuril Islands. Indeed the common cause of containing and mitigating the North Korean nuclear threat, in which Japan and Russia currently find themselves, may be beneficial for Russia insofar as it may lead to an increased Russian standing in the Northeast Asian region. For Japan, it may smooth the way for a deeper dialogue with Russia on concerns of mutual interest, especially the Kuril Islands. Recent security developments on the Korean peninsula are likely not enough to induce a full-scale Japan-Russia rapprochement. Nevertheless, North Korea’s fourth nuclear test has opened up yet another opportunity for cooperation between Moscow and Tokyo. There are, in fact, several indications that hint toward a possibility that Moscow and Tokyo may be able to put aside their differences to a greater extent. The Japanese government has recently indicated that it will pursue a more independent and proactive diplomacy aimed at restructuring the security order in Northeast Asia, after accusations of being too passive with regards to letting the United States take the lead. While Japan has generally been more in step with the West over Russia’s foreign policy actions over the past two years, a more independent Japanese diplomacy may see it in its better interests to seek greater rapprochement with Russia. Last summer, in response to the question of a Russian invitation to the 2016 G7 summit in Japan, the government in Tokyo said that it was undecided. Such an answer demonstrates that Japan had not completely closed the door on Russian participation, although Russian foreign minister Sergei Lavrov had indicated he would not hold out hope on an unofficial G8 format. There are also, however, several pitfalls and potential snares to greater Japan-Russia cooperation over the North Korea test. Other states in the region may view Russia’s participation in handling the crisis as a distraction. Indeed, despite the recent downturn in China-North Korea relations and the subsequent warming of ties between Moscow and Pyongyang, many are still hoping that China will use its influence and leverage to rein in North Korea. Despite Russia being a permanent member of the UN Security Council, there is no guarantee that Russia will be given a major voice in attempting to dissuade further North Korean adventurism. Especially given the negative global reaction to Russian intervention in Syria and Ukraine, many may be tempted to exclude Russia or otherwise excise them from the process as much as possible, aside from token gestures of inclusion. Furthermore, economic factors regarding the Russian Far East will also be an important consideration. Japanese diplomats have entered into discussions with their American counterparts regarding new sanctions against North Korea. For its own part, Russia joined in the UN-imposed sanctions against North Korea after its last nuclear test in 2013. Yet as part of Russia’s policy of “pivot to the East”, Moscow has been striving for ways to induce economic development and investment in its Far Eastern region. Specifically, Russia and North Korea recently discussed the possibility of building an “Asian trading house” between the two countries in order to increase bilateral commodity turnover. With Russia keen for any form of economic benefit to its Far East territories, and having suffered under the constraints of economic sanctions itself since 2014, it may be wont to join in more trade-related punishments against North Korea. Nevertheless, from crises opportunities also often stem forth. It is unreasonable to expect that unity between Moscow and Tokyo over this latest development can somehow provide a magic solution to the multitude of difficulties with which the Japan-Russia relationship must contend. Yet with careful diplomacy and a skillful coordination, this crisis may open the door to a broader Japan-Russia partnership. If such a partnership does not in fact materialize, it may at least generate some degree of goodwill that can propel Japan-Russia relations forward into a more cooperative interconnection. Tony Rinna is a specialist in Russian foreign policy currently based in South Korea. Follow him on Twitter at @TonyVRinna.